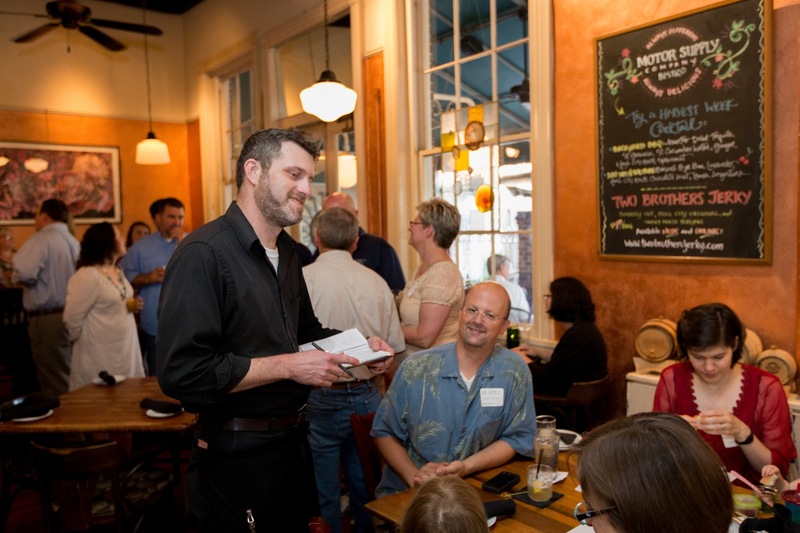 September 11, 2014 (Columbia, S.C.) – Since 1989, Motor Supply Co. Bistro’s food-obsessed staff has been one of the driving forces behind the farm-to-table initiative in Columbia, S.C. There have been changes behind the stove and the bar; in the décor and techniques (including a comfortable, new outdoor patio as of August 2014); and at the host stand, when longtime GM Eddie Wales became owner in the year 2000. However, one thing has not changed – Motor Supply’s dedication to supporting local, sustainable Midlands farms and celebrating the Slow Food principles of "good, clean and fair" foodways, all in a casual, relaxed environment. This fall, Motor Supply will celebrate its 25th anniversary during Fall Harvest Week, October 7-12, 2014. This will be the 7th biannual occurrence of the farm-to-community event at the historic Vista restaurant that has become a must for locals and visitors alike. Harvest Week will kick off on Tuesday, October 7, 2014 with Meet the Farmer Happy Hour, 5:30-7:00 p.m., when the public is encouraged to come grab the first sip of the exclusive, limited edition Harvest Week Cocktail List, and meet and chat with the local farmers featured during the weeklong celebration. Motor Supply Head Barman Josh Streetman shines with his daring and progressive pairings of homemade bitters, house-infused liqueurs and farm-to-shaker produce. One of Motor Supply’s more recent additions, Executive Chef Wesley Fulmer – previously from James Beard Award-winning restaurants in New Orleans and Philadelphia as well as Kiawah's Atlantic Room – rose to the occasion during his first Harvest Week in June 2014, concocting bold, flavorful entrees like a coupling of seared duck breast and duck confit crépinette, as well as a housemade rabbit ravioli, both featuring Midlands farms. What will Chef Wes whip up this time? Harvest Week at Motor Supply began in 2011 as a way to highlight Motor Supply’s year-round partnering with small, sustainable, organic and near-organic farms in the Midlands – and continues as a way for the restaurant to thank local farmers for their hard work by highlighting each farm’s best seasonal ingredients, combining them in a distinctively Motor Supply fashion.